20 Ways To Pinch a Penny! | Happy Deal - Happy Day! 20 Ways To Pinch a Penny! 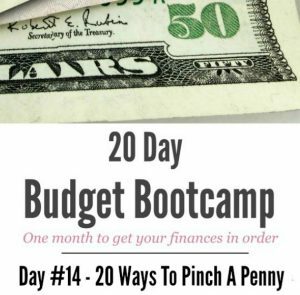 Welcome to Day #14 of my 20 Day Budget Challenge! Today I’m going to share with you one of my favorite days of into and give you a quick list of 20 ways to pinch a penny! Some of these you are probably already doing. But some of these are a bit outside of the box, so hopefully will inspire you to pinch in ways you haven’t thought of before. 2. When shopping online, use cash back sites like Ebates. I have been a member on Ebates since 2009 and have earned $585.21. 3. Buy refurbished. I have a Dyson vacuum cleaner that I LOVE! But the only way I could afford one at the time of purchase was to get refurbished. If you don’t mind slightly used for great products, this can be a huge money saver! 4. Get name brand clothing at thrift stores like Plato’s Closet. I hit my local store recently and got a cute Aeropostale shirt for $3! 5. Find promo codes for online purchases. You know how when you are checking out, you usually see a box where you can fill in a promo code? Use sites like Retailmenot.com to find those promo codes for possible savings. A site that I’m liking even more now is Dealspotr.com because they will reward you with Amazon gift cards if you share deals and promo codes! 6. Sell your stuff. If you haven’t read this already, read how to Earn Extra Cash by Selling Items Around the House. This isn’t to save money directly, but if you sell your stuff, you will have extra cash for an item you have your eye on. For example: Sell larger ticket items on Ebay.com. Sell books on Half.com. Don’t want to worry about shipping items? Sell locally on Craigslist.com. Set up your own garage sales. Offer your items to thrift stores that will give you cash for your used goods. Are you crafty? Set up shop on Etsy.com or Handmade Amazon like I have! 7. Buy off season. I have done this all along for clothes for my daughter. When winter ends, I hit the clearance sales, and buy the size she will be in the following winter. I purchase Christmas dresses after Christmas in next years sizes at clearance prices. No way am I paying full price for those “special, possibly wear just once” dresses! ← Kids Eat Free – Guide of Restaurants and Days of the Week to Get Free Food For Kids! 2 Responses to 20 Ways To Pinch a Penny!